You can listen to and order Foot in the door (EP) here. Watch the video here. A few years back I found a link in my mailbox offering a free album. It was 'Antiques' by Patrick Joseph, an interesting album that I played for quite a while, but as things go, it sort of went off my radar. 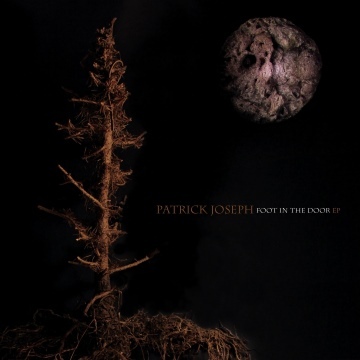 Till this weekend when I found a new link from Patrick alerting me that he has a new EP out called Foot in the door. That made me focus and so I started listening. Foot in the door contains music of a fleeting beauty. The air in my room moves like digital ghosts in a movie. The music is light, Patrick Joseph's voice high and light. He sings undercooled, with emotions hiding below the surface. Even resigned, but hopeful. It is good enough to stand its own ground, so I will refrain from comparing. But if you are into the likes of Josh Rouse, Shane Alexander, Ryan Adams, to name but a few, chances are that you have a new act to follow. Below the organic surface of the music in the title song, there is a digital realm hoovering in the background. The intro that opens the EP reveals just this, before the song reveals itself as a jazzy, but stark mid-tempo song. A strong, prominent drum, with Patrick Joseph's voice, rough edged, right in the middle in front of the drums. All other instruments are mixed to the side, until the guitar solo that is. At the end of 'Foot in the door' the digital beat is allowed back in, mixed behind the electric piano. A strong song and a well selected taster for the forthcoming album, 'Moon king'. In 'Piece of your love' Joseph sings "I've kept my distance for long enough". Just as well he already has his "foot in the door". This song is more up-tempo. Again I noticed how spacious the music is mixed, with enough room for all the instruments that clearly serve the singer. Patrick Joseph is the man these songs are created for. Again the electric piano is prominent as well as an acoustic guitar. Both lend 'Piece of your love' star quality together with Joseph's voice that reaches a higher register, singing without force nor forcing itself. 'Setting sun' is a beautiful ballad. More sparingly arranged, more modest than the opening songs. With a beautiful image: "when your terracotta army is on the run". Over to soon, which is usually a good sign. I have less room for 'The last laugh'. The rhythm doesn't agree with me. Patrick Joseph's voice saves the song as he let's us hear the rougher register next to his soft one. The man can sing and he showcases just that in 'The last laugh'. When all is said and done, Foot in the door delivers what his cd 'Antiques' promised. Great singer-songwriter, folk and pop songs in an interesting combination. This EP tastes like more, so I'm definitely looking forward to 'Moon king'. Blak and blu. Gary Clark Jr.